HIGH Flinging Joule around with the spider bot. LOW A marathon of poor design choices in the endgame. WTF Joule’s rather uncanny resemblance to Rey from The Force Awakens. I don’t want to live in a world where a collaboration between the director of Metroid Prime and the co-creator of Mega Man turns out this poorly. Although neither men have (to put it charitably) produced their best work in recent years, Mark Pacini and Keiji Inafune are still gods among developers, responsible for some of my favorite titles of all time. When these two put their heads together and the sloppy, half-baked ReCore is what they come up with, what’s left to believe in? What makes ReCore especially frustrating is that, amidst all of its issues, I can distinctly feel the influence of the games that make these two creators so legendary. On Pacini’s side, this is perhaps a truer successor to Metroid Prime than its actual sequels were, as an open-world exploration game set on a planet rife with strange mechanisms and featuring a heroine who seems well-suited to being the only human in the vicinity. The combat even directly channels Prime in that it forgoes the usual dual-analog scheme in favor of lock-on targeting. As for Inafune… well, the man certainly likes robots, and ReCore is full of them. The setting is Far Eden, a desert planet that humanity once attempted to terraform after Earth went bust. Our heroine, Joule, was among the first colonists. When she awakens after two centuries in cryosleep, the place is still bone-dry and the sentient robots sent to aid the project have now taken over. While there’s some intrigue over the whereabouts of the rest of her species, Joule’s primary goal is to repair a nearby terraforming tower. For some reason this involves gathering shiny orbs, that most arbitrary of video game collectibles. Joule is a spunky, energetically-voiced protagonist, but ReCore’s real stars are the handful of robot buddies that she picks up along the way. Although the enemies are spiky and severe in appearance, her allies – a dog, a spider and a gorilla – are all animated to adorable perfection and even speak their own garbled language that’s never translated. It’s the robot pals and Joule’s cute conversations with them that rescue ReCore from being a somber affair. Despite being confronted with the possible extinction of our species, we never feel entirely alone. These robot friends also provide Joule with various abilities that expand how much of Far Eden she can explore, and that’s where ReCore starts feeling more than a little like Metroid. When Seth the spider joins my party and I’m granted the ability to scale certain walls, I suddenly want to backtrack and scan for secret locations that I couldn’t reach the first time. 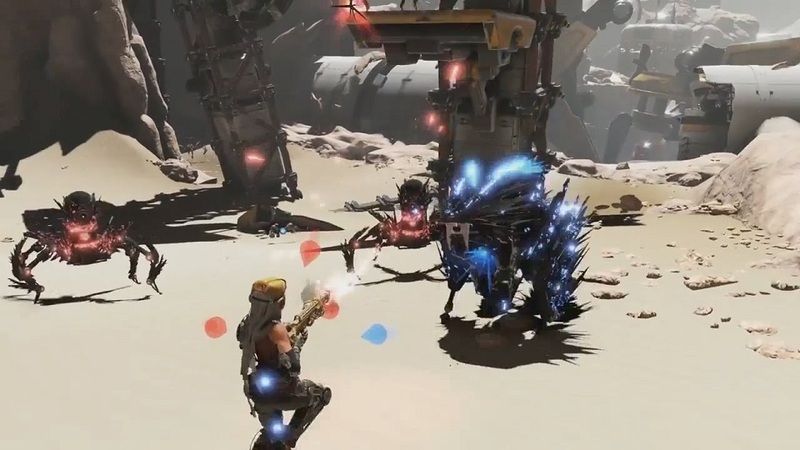 ReCore is good about teasing players with things that won’t make sense until later – objects they won’t initially know what to do with, jumps they initially won’t know how to make. That’s the spirit of Metroid and there are moments when ReCore recaptures it exquisitely. I enjoyed ReCore most when I was allowed to appreciate the often overwhelming scope of its outdoor environments. There’s a wonderful sense of verticality to these levels – they’re not just wide, but tall. I was often surprised how many of the dilapidated structures littering Far Eden’s landscape weren’t just window dressing, but could actually be scaled. There are snippets of exhilarating 3D platforming here, and ReCore’s strong art direction means that the scenery’s always lovely to look at from high places. Unfortunately, the game wears out its welcome. Even with outdoor areas this expansive, it’s difficult to justify the obscene amount of busywork that ReCore asks players to do. The first mistake is that Joule herself doesn’t directly benefit from most of the materials she collects, as the vast majority of them are used to upgrade her AI-controlled robot pets. If I’m hunting for upgrades in a Metroid game, I want to know that it’ll pay off in a substantial way… that the extra health or ammo might save me in a future battle. For ReCore’s collectibles to have such a passive impact is like pulling overtime at work and then spending the money on toys I don’t get to play with. Worse are the “prismatic cores,” those shiny orbs that represent ReCore’s mandatory collectible doodad of choice. The game’s final level remains walled off until Joule has gathered an obscene number of them, and while I thought I’d enjoy an excuse to retrace my steps in a game with such strong exploration elements, a number of prismatic cores are tucked away in optional dungeons, and these are ReCore’s absolute lowest moments. About half of them are wave-based battle arenas, and while I don’t mind ReCore’s combat in short bursts, these concentrated doses showcase how unreliable the targeting system is and how over-cluttered the action gets in tight spaces. The rest of the dungeons are platforming gauntlets that represent twitch gaming at its most arbitrary. They’re just linear sequences of floating platforms in dull-looking underground corridors. There’s nothing imaginative or necessary about these segments, and they do nothing but dilute the good will I had toward ReCore. Also, quite a few of these levels are locked until players have gathered security modules scattered throughout the surrounding areas. Meaning? I have to collect stuff to get permission to collect stuff. Even worse, the respawn points are utterly borked. On multiple occasions, I’d get caught in a loop where a trap would knock me off a ledge and the game would spawn me directly back into the trap, and this would happen over and over again as I watched helplessly. For this kind of oversight to happen at all is unacceptable; for it to happen more than once makes ReCore unfit for release. Capping it all off, once players actually go through the trouble of unlocking it, the final dungeon is a slog of the highest order — a five-level marathon through more combat arenas and more twitch platforming segments, all set in bland environments that look like the VR missions from Metal Gear Solid. The final boss is a trash mob jamboree, and then the campaign just halts with a sequel-baiting non-ending that feels like an insult given all of the busywork we went through to get there. We have to go back and fetch all of those prismatic cores for that? The lengthy load times that have reportedly plagued the Xbox One version are thankfully not an issue on PC, but the game’s full of technical hiccups regardless, from framerate drops to outright glitches (such as enemies occasionally getting stuck behind walls). Microsoft’s decision to release this game exclusively through the Windows Store also presents enough functionality issues to warrant a separate article altogether. Needless to say, the sooner they start releasing games on Steam, the better. Disclosures: This game is developed by Comcept and Armature Studio and published by Microsoft Studios. It is currently available on Xbox One and PC. This copy of the game was obtained via paid download and reviewed on the PC. Approximately 13 hours of play were devoted to the single-player mode, and the game was completed. There are no multiplayer modes. Parents: According to the ESRB, this game is rated Teen and contains violence. There’s nothing to worry about here; it’s just cartoon violence against robots. Not a drop of blood in sight. Deaf & Hard of Hearing Gamers: Subtitles are available for dialogue. For some reason, autoplay for audio logs isn’t subtitled, but transcripts are available in the menu. Sounds does not play a particularly vital role in the game. Remappable Controls: Yes, this game offers fully remappable controls, but only for keyboard and mouse. Gamepad controls are not remappable. This review was spot on. I got 3/4 through and became discouraged and disappointed to go on.